Bolton Wanderers fans have united to form a supporters' trust in light of the club's financial problems. 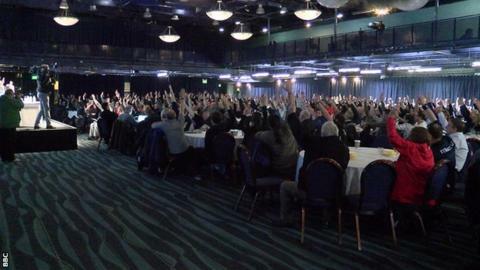 Over 1,000 fans turned up at the Macron Stadium to vote for the creation of the trust, with club financial advisor Trevor Birch attending the meeting. The Championship strugglers have been put up for sale by owner Eddie Davies, with debts of £172.9m and a winding-up petition issued by Revenue & Customs. The trust hopes to work with whoever takes over the Lancashire side. The Wanderers' financial troubles led to players and staff being paid late in December, while the club is under a transfer embargo for the rest of the season after failing to submit their required accounts. Former Bolton strikers Kevin Davies and John McGinlay were also in attendance as they gave their support to the new organisation. "If I can help in any way with the trust or in any other way, like finding investors, I'll do it as I love the club," Davies told BBC Radio Manchester. "It's still in a perilous position and a lot of questions still need to be answered going forward but this is a start." Manager Neil Lennon revealed that Bolton, who sit bottom of the Championship table, could sell players this month to raise funds with the January transfer window open, and they have already received approaches. "We've had one or two offers in that haven't been accepted," said the former Celtic boss. "It's back in the court of the other clubs and the interested parties. "Obviously it's not ideal, but in the short term it's important that we can raise some capital to keep the club going for this month." Lennon was also asked if there had been any update on a potential takeover, to which he replied: "I know there were some potential buyers in this week having a look at the books but nothing concrete just yet."